Photo copyright Filet in Tondo. 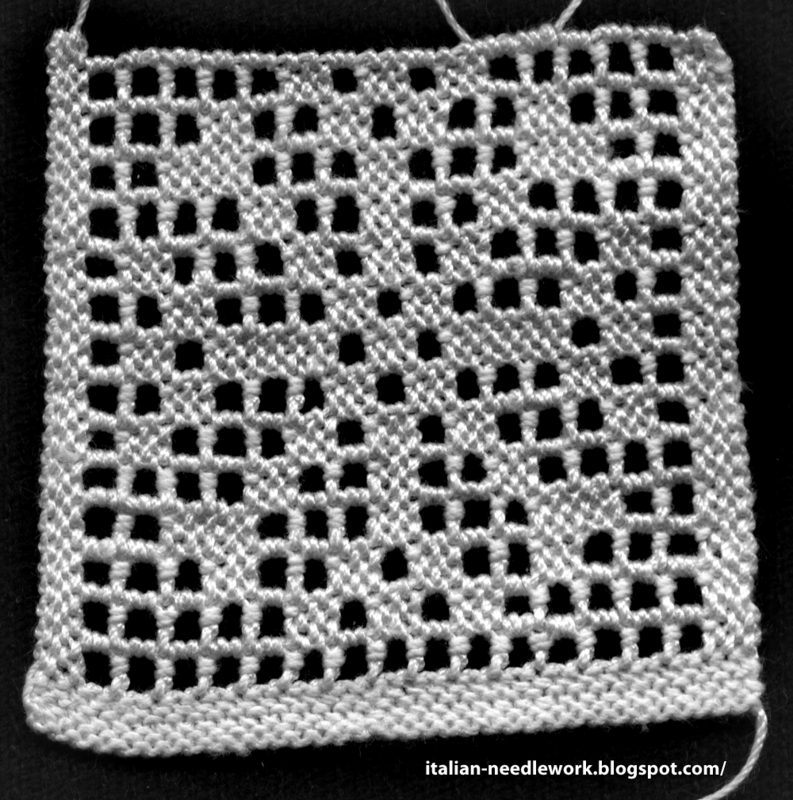 Enza Termine has updated her website and added some more photos of her exquisite Circular Filet Netting works. 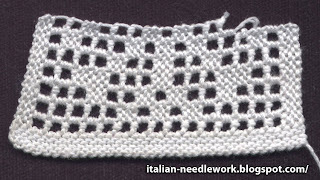 There is a tutorial [in Italian but there is a Google Translate button on the website] on how to get started with Circular Filet Netting and if you were put off because you didn't know what to make besides a doiley which may not go with your home decor, browse through her galleries to be inspired for other projects! 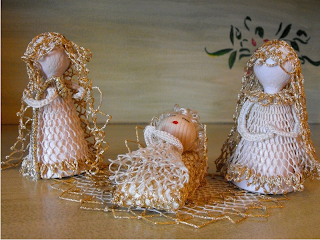 I love her Nativity Scenes! 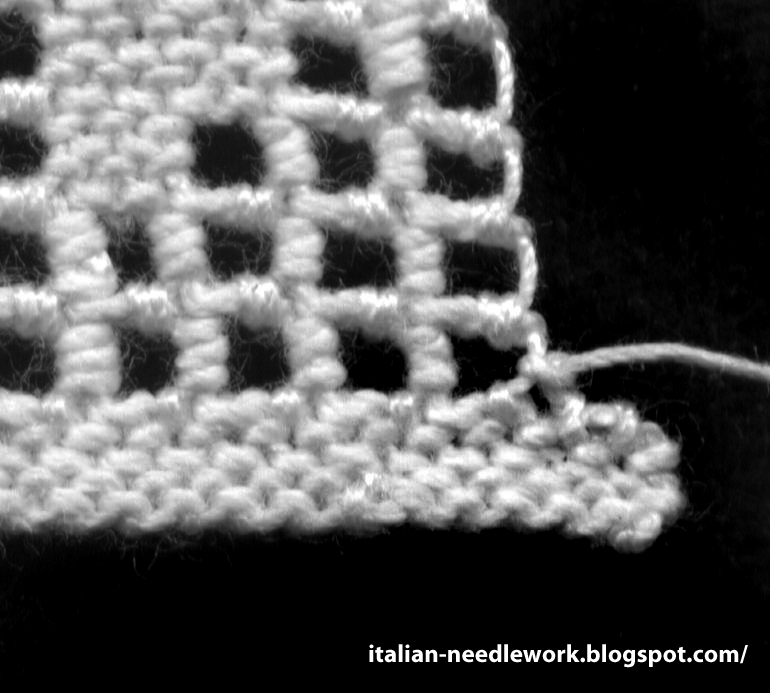 I hope this Holiday Season finds you exploring Italian Needlework and perhaps it is inspiring you to try new techniques in the New Year. Continuing on with our little Puncetto Snowflake (see Part One and Part Two), we left off last time finishing up the top selvedge. Last row, return to the extreme right edge. Turning the work back 90 degrees, it looks like this. 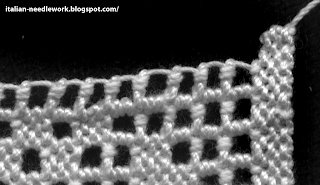 If you're done here, you can just make a small stitch to secure both thread ends in the corners and trim the excess. 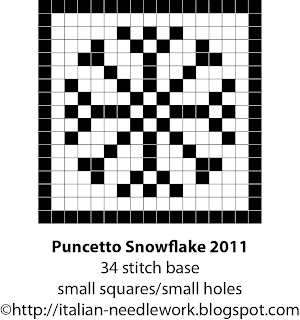 You could put your Puncetto Snowflake into one of those cards that have a cut-out area on the front inserting perhaps a red, blue or green background and send it off to your favourite stitching friend. Or, you can finish the edge as you would if you were going to insert your snowflake into a piece of fabric. This makes a nice lacy edge even if you're not inserting it. Doing the edging also hides imperfections in your selvedges and somehow stretches the piece out and back to square if it has become warped in the stitching process. 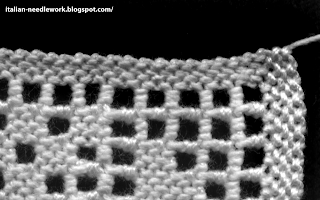 To add the edging, we're going to continue on with the thread from where we left off at the corner. 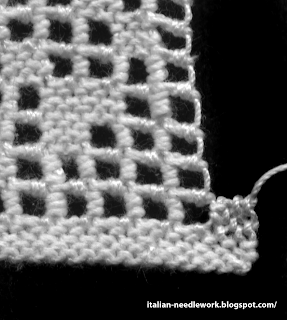 The outer lacey edging is just like making the small holes as we did in the first and last rows of our design. 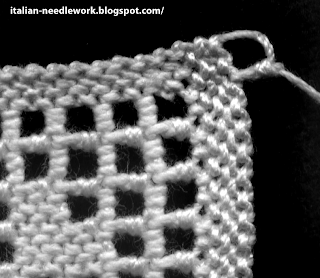 Skip one stitch and insert your needle into the next, leaving a bit of a loop do a hooking on stitch and two return stitches to form a column. Continue on to the end of the row. For this design, you should end up with 17 loops (or small holes) because we have 34 stitches along the edge and we're putting a column in every second stitch. 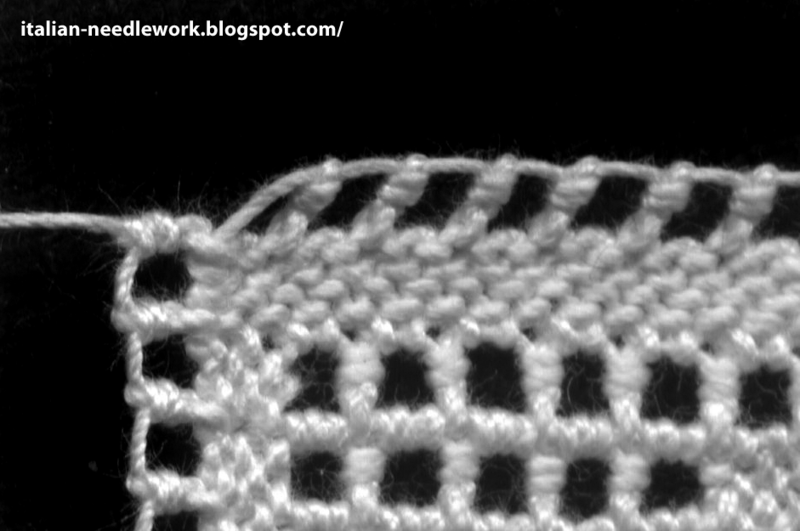 I turned the work so that my stitching is along the top, I find it easier to work this way. Here we are at the end of the first edge with 17 loops or small holes. 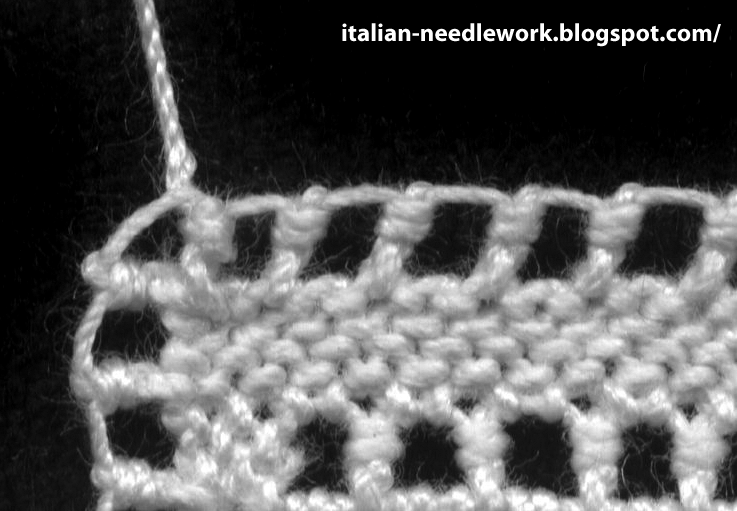 Here you will need to insert the needle into the same stitch as the previous column so that you can form the corner loop. 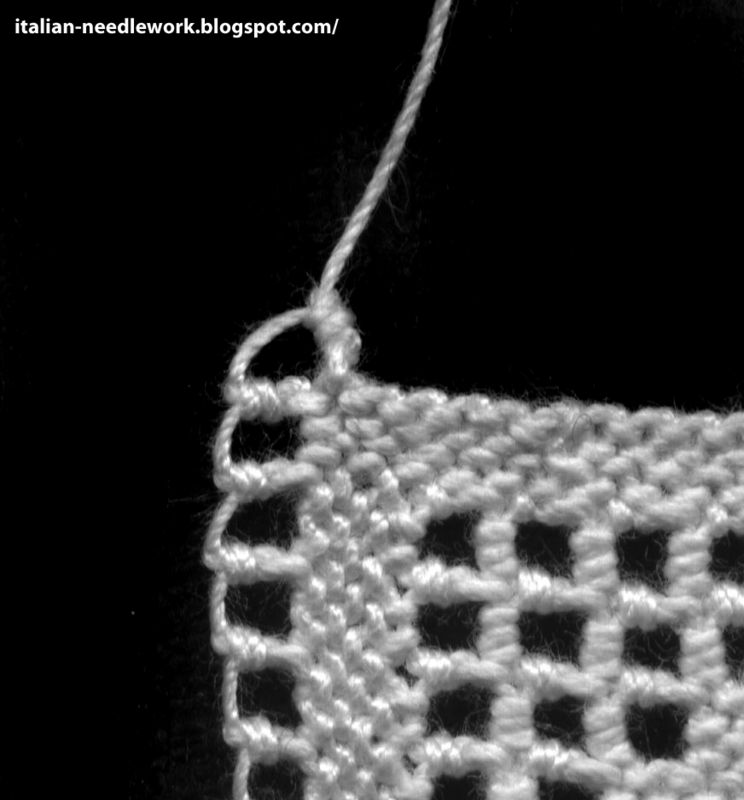 Do your hooking on stitch taking care to make your corner loop the same size as the others. Then take your needle behind both vertical threads and do two return stitches to form a single column. You end up with your needle and thread in front of your stitching instead of behind it where you normally would be. Pass the needle through the corner loop to take your thread to the back. Here we are, all finished our Puncetto Snowflake! I soaked mine overnight in some Marsiglia soap (as it's called in Italian) to whiten it back up. I had a few blood stains to get rid of for which the best remedy is your own spit - no really! It works like a charm. Then I ironed my snowflake face down on a towel. To finish my thread ends, I just did a really small stitch on the back with both thread ends on either corner and trimmed the excess thread. I'd love to hear from you if you found this a useful exercise, and even if you did not, please post below! 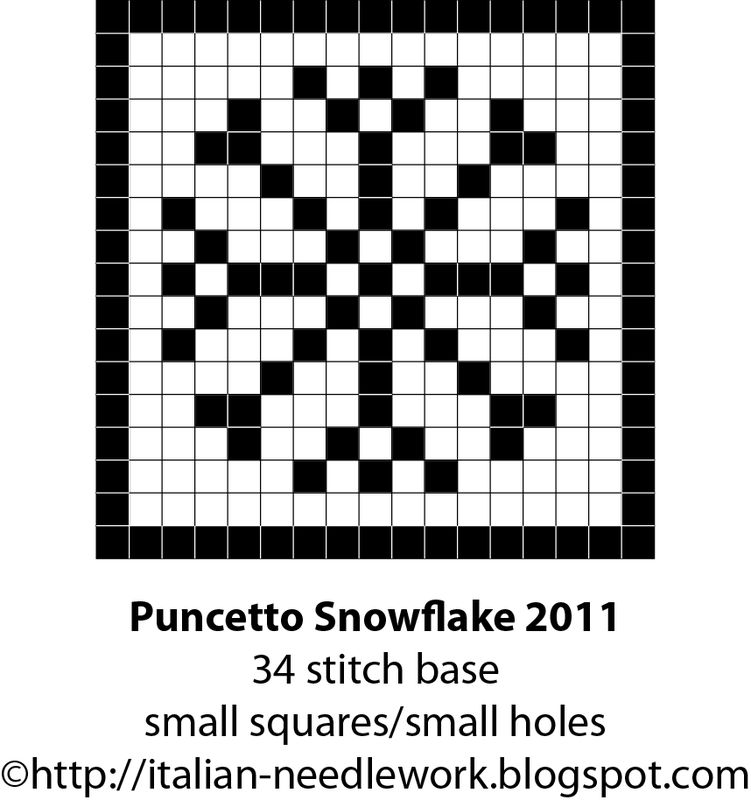 Since I posted part one of this Puncetto Snowflake I have broken three threads! Luckily they were in places where they were more or less easily hidden. If you look for them, you'll probably find them but I was not going to start this again for the 5th time! The two threads on the right are where I changed threads on my return trip and will be trimmed when they are more secure. Following along the pattern, I worked my way up to the top where I needed to think about the steps ahead. As we will not be doing a return row in the normal way for the last row of small holes at the top, we need to change threads for a fresh and long new thread somewhere in the second-to-last row so that we will have enough to complete the top selvedge and the loops around the edge if we want them for inserting our snowflake into a piece of fabric or if we just want a lacey edge. This is the second-to-last-row completed. You can see where I changed threads on the return row (at the right) and I've done my two rows of stitches on the left selvedge to begin the last row of small holes - exactly the same as the first row we did down at the bottom. After having completed the forward trip on my last row of small holes, I will not be making a return trip in the normal way. Instead, we will begin to create the top selvedge. Here is where it can get confusing. After finishing the forward row of small holes (you're positioned on the extreme right), you must do two stitches of a normal return row which will take you back to the left side of your right selvedge. 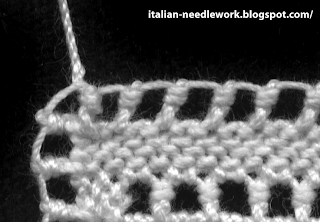 From here you will complete two more forward rows of two stitches as shown above. 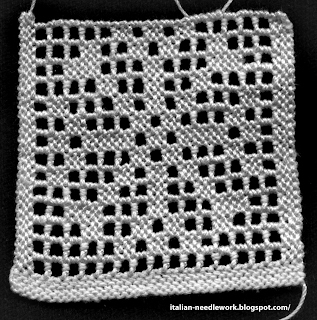 Do two stitches on your return and then turn your work 90 degrees clockwise and do two more return stitches as shown above. Are you still with me? This is our first stitch in the hole. This is the second stitch in the hole and we've gone ahead with two stitches to the edge. You can see that we are beginning to build our selvedge. 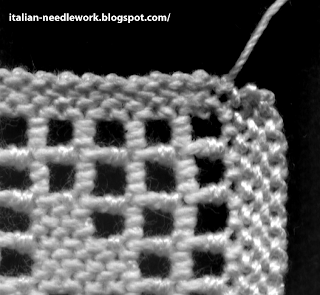 Again, please remember that this rule of two stitches in the hole applies to small holes and that the rules are different for medium holes and also different again for large holes. Continue in this way until you get to the top. There is a bit more to show you which I'll continue in another post. If you are just joining us, take a look at the first part of our Puncetto Snowflake. 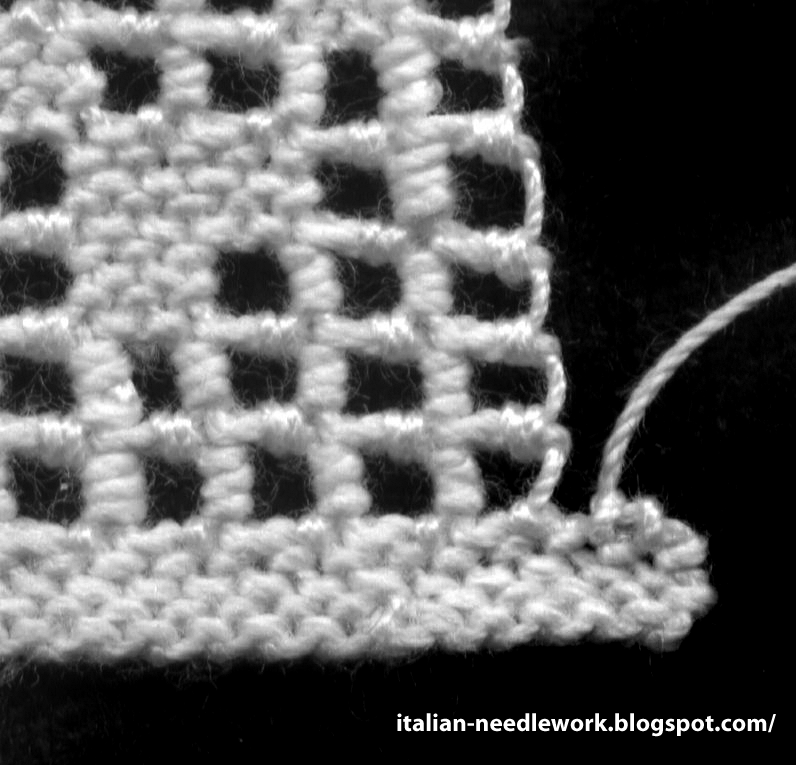 It is with great sadness that I tell you that the Italian embroidery supplies website Italian Needlecrafts will be closing at the end of December (last day to place an order will be December 27th. For me this is terrible news. Elena has tirelessly provided me with exceptional service. All those lovely Italian linens and threads, the books, the patterns... well, I'm very sad. If I could figure out how to change the blog to all black, I would do it. Inspired by Renata's punt'e nù snowflakes, I decided to try my hand at a Puncetto Snowflake. Keeping in mind that I really shouldn't be trying to design patterns for Puncetto as I have nowhere near mastered the technique but you know, I was caught up in the holiday season. I discovered that designs for Puncetto are not all that easy to make. 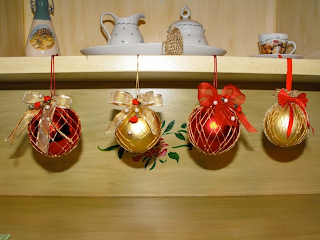 You must keep it simple and small, otherwise you end up with a huge motif! My first design ended up having a base of 86 stitches... quite out of the question for a beginner like me to stitch, I don't even know how to do a selvedge of 86 stitches without running out of thread! Downsize and simplify. Ok. Design number two had a base of 48 stitches. Still too big for me but getting closer to a manageable size. 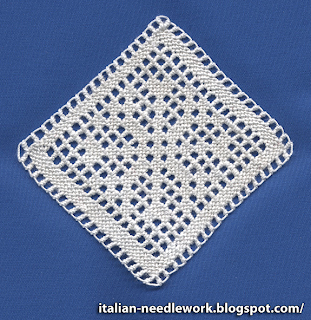 Since I had already done a 34 stitch base design from the Puncetto Valsesiano book, I thought I could live with design number three. 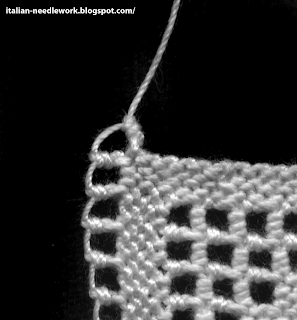 I seem to have the hang of doing small squares and small holes without much trouble now, so this design uses those. 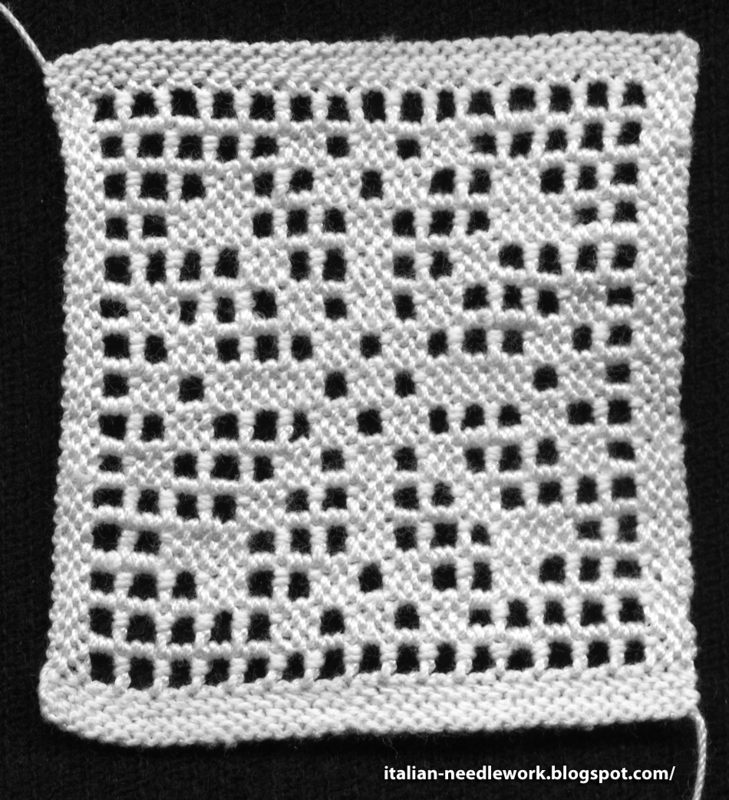 A small square is made up of two stitches doing two forward rows. I then tried to stitch this up using DMC Cordonnet Special #20. Can you believe that I tried three times and broke the thread in various inconvenient places? Very frustrating. I thought perhaps my thread was old and somehow compromised so I switched to a different ball but the same thing happened! This time thought it was even more frustrating as I had gotten almost to the half-way point. This must mean that I'm pulling too tight! I also have the horrible habit of splitting the thread with the needle which breaks it. Argh! I cut off my thread to get it out of the way at the top of the column but can you see where the thread broke? How do you fix that? Back to square one. This time I decided to take some photos along the way. This is my selvedge or cimosa in Italian. Those little bumps are my stitches and I've triple-checked them so that I have 34. 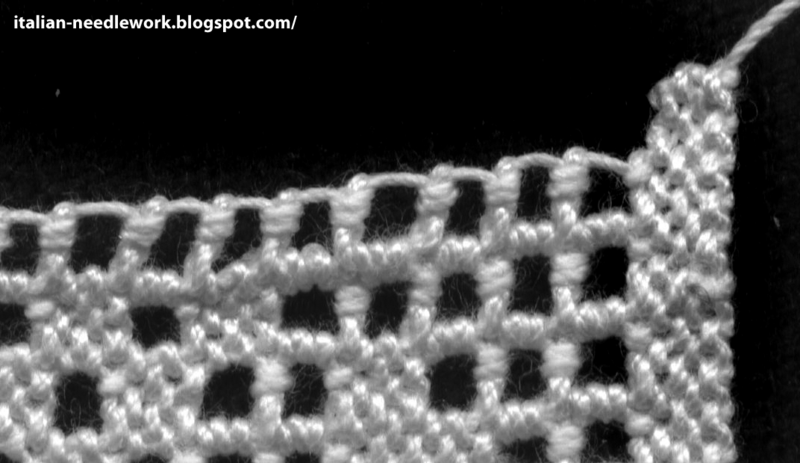 Now I have to do the left edge which consists of a small square, two stitches doing two forward rows (click on the images for a closer look). First forward row of two stitches. 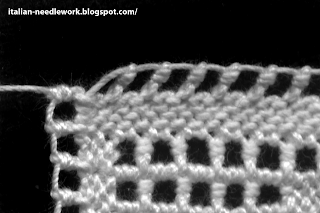 Return row of two stitches. 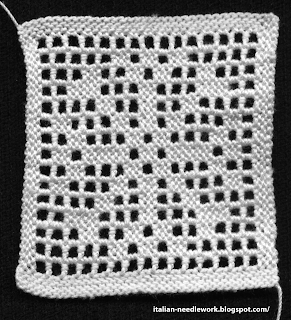 Second forward row of two stitches. 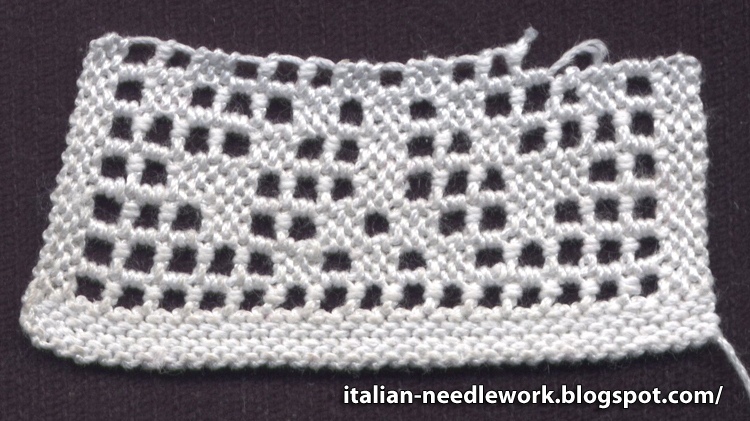 Next I have to do the small holes of the first row (in Puncetto you work bottom to top). These are small holes so I do a hooking on knot in every second stitch to get 15 holes. The hooking on knot which is call aggancio in Italian. On our return trip (after the first forward row) we need to catch and include the loose thread, so think of it as another hooking on stitch which doesn't enter into our calculations but needs to be there. I pull a little tighter for these ones to give my hole a better shape. 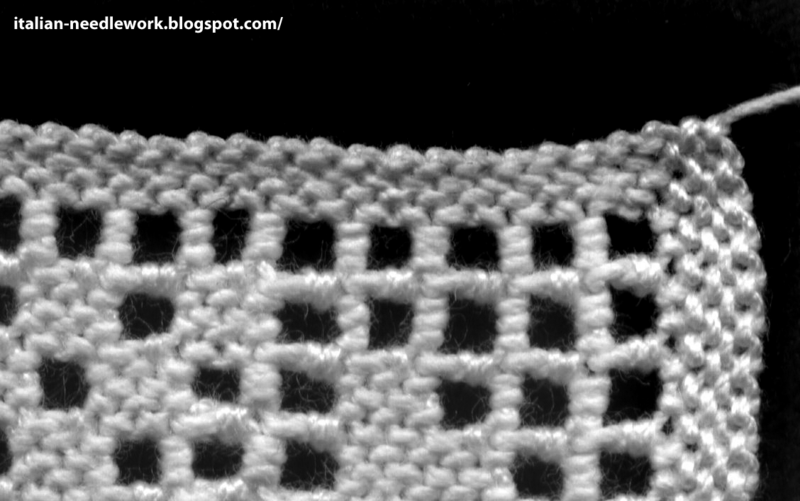 Click on the photo for a closer look, I've highlighted the hooking on stitch that I'm talking about in red. Now we're ready to go back to the beginning for our next row. We need to set ourselves up though by looking ahead at the pattern to see which holes will be empty and which will be filled in the row above, as we will do one less knot for the filled squares. I had to change threads so you can see my ends which will be cut off later when they are more secure. Well, so far so good, no breakage. I won't push my luck, that's it for today. If you want to stitch along, I'll be happy to answer questions but please remember that I'm stumbling along myself. If you are a reader who knows how to do this, and you see something I'm doing incorrectly, please leave a comment below!